Henri d'Orléans, the comte de Paris and Orléanist pretender to the throne of France, has died at the age of 85 on 21 January 2019. 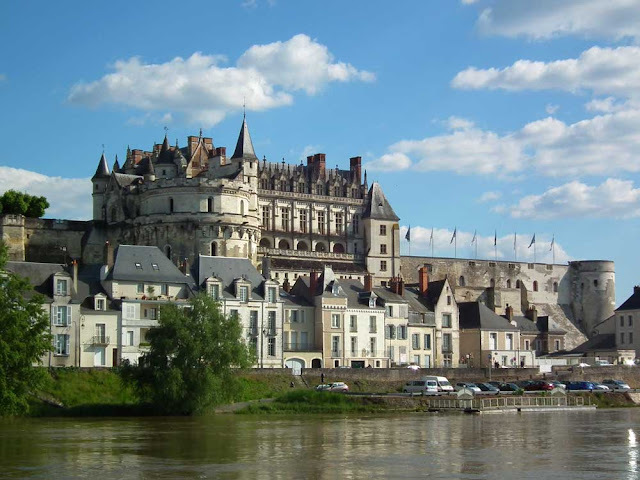 He used to regularly visit the Chateau of Amboise, owned by the Fondation Saint Louis set up by his father. He was born on 14 June 1933 in Belgium where his family was in exile. The oldest of the descendents of the Orléans branch of the royal family, he inherited his title on the death of his father in 1999. His son Prince Jean de France, 53 years old, will succeed him as head of the House of France and will become the Comte de Paris (Count of Paris). Their claim to the throne comes from their direct descent from Louis XIV's brother and Philippe Egalité. For details of our private guided tours of chateaux, gardens, wineries, markets and more please visit the Loire Valley Time Travel website. We would be delighted to design a tour for you. The walking club 11km Thursday walk on 17 January, our first proper outing for the year, was from Le Grand Pressigny up to the Chateau de la Vienne then down to Etableau and back to Le Grand Pressigny. Here are some pictures from the walk. 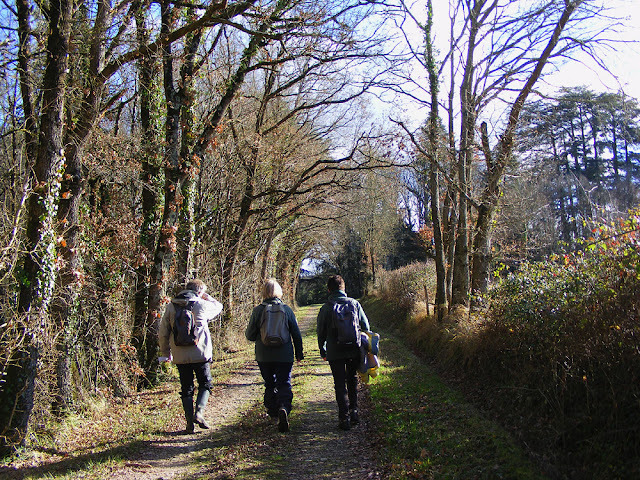 Walking down the track to the privately owned Chateau de la Vienne. 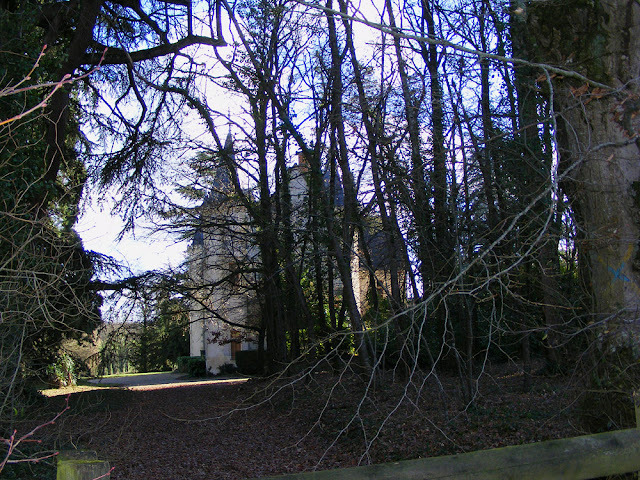 The 19th century Chateau de la Vienne, glimpsed through the trees. View over the Claise Valley to the Chateau of Etableau. Roe Deer Capreolus capreolus (Fr. chevreuil). 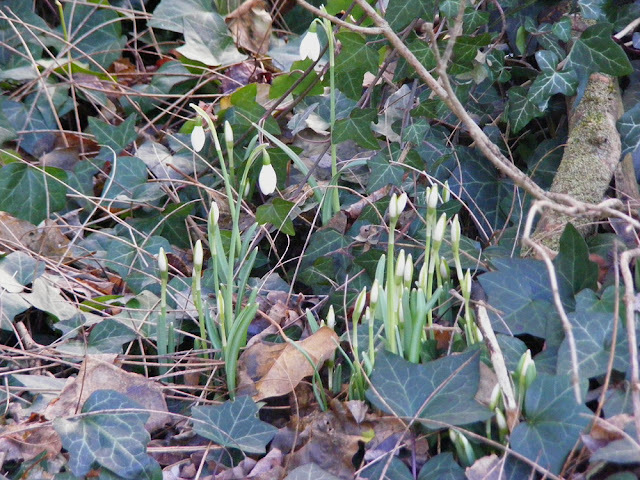 The first Snowdrops Galanthus nivalis (Fr. perce-neige) are appearing. The ruined fortress of Etableau, seen from across the Claise Valley. Newly cut willow withies for wickerwork. 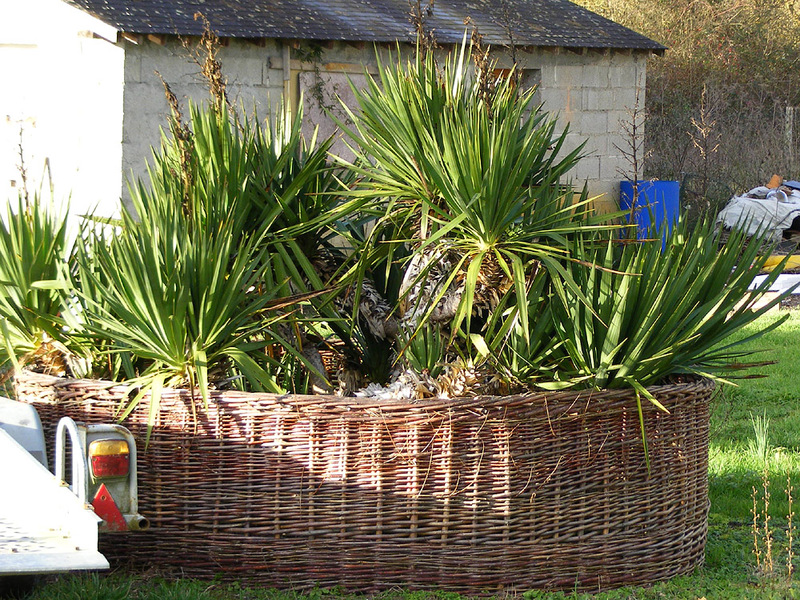 Handmade wicker garden enclosure with yuccas in the village of Etableau. An old railway cottage, now someone's private country hideaway. The blue and white enamel number plaque on the cottage is not the street number -- there is no street. 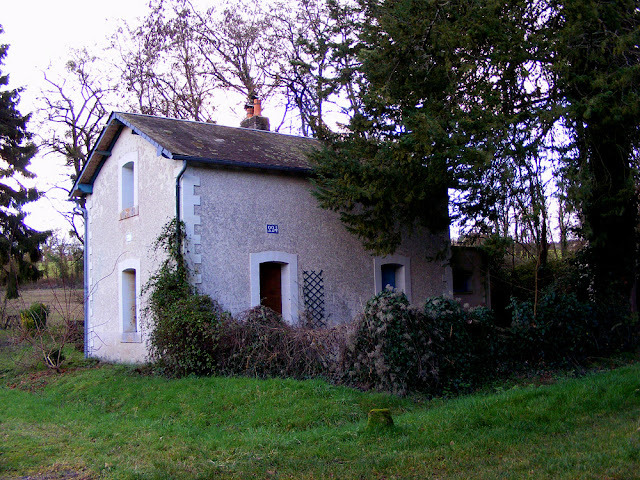 The number tells you that the cottage is 224 kilometres from Paris on the railway line. 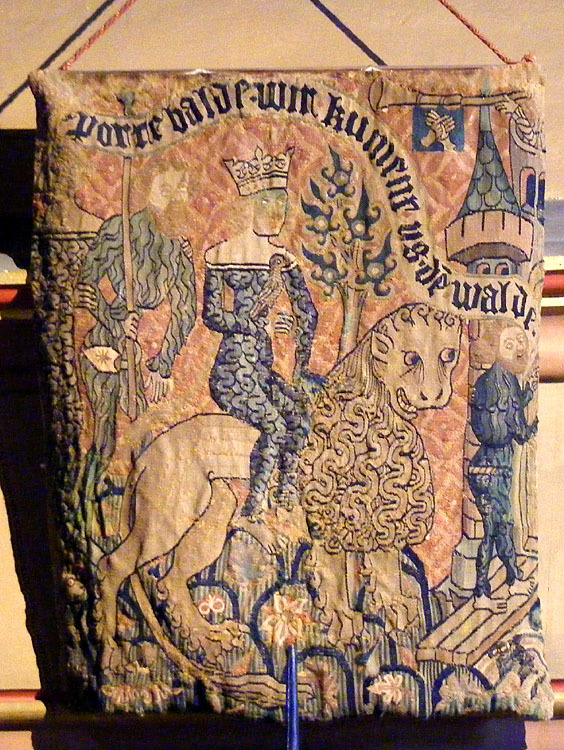 This very fine silk and wool tapestry is one of fewer than half a dozen survivors of the 16th century tapestry workshops of Tours. 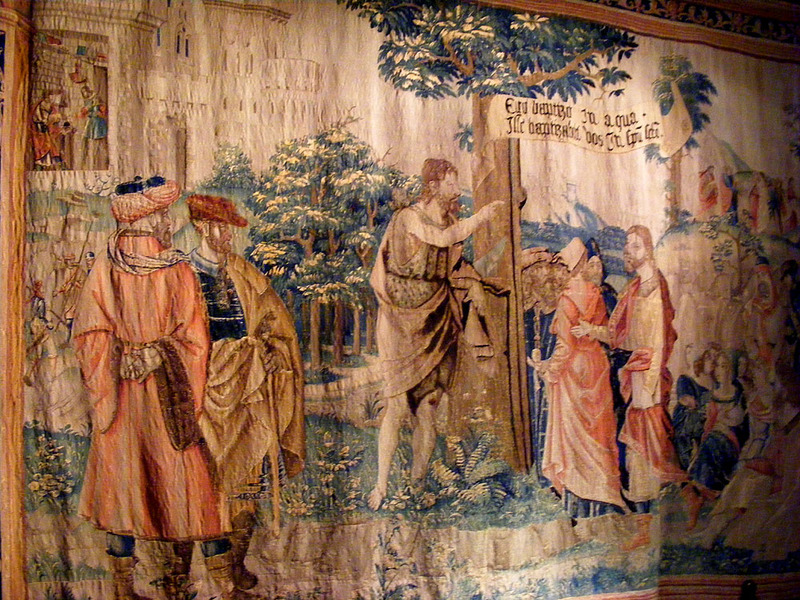 The reason such tapestries are so rare is that, although the silk producing and weaving industry was well established in Tours from the 15th century onwards, and peaked in the 17th century before being superceded by Lyon and dying in the 19th, there were only ever a few tapestry workshops in the city, perhaps just for a few decades from 1520. The quality is so high that the output would necessarily have been small and the majority of weavers in the city, hundreds of artisans, were not working on tapestries but on cloth for furnishings and clothing. 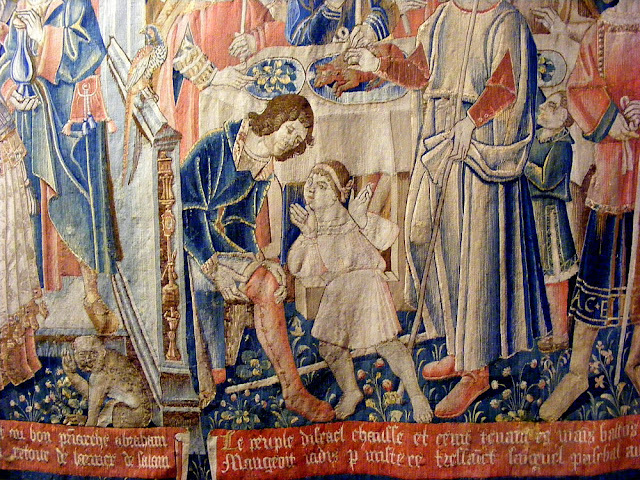 The tapestry is part of the collection of the Chateau of Langeais and is one of a set of four depicting the life of Saint Saturnin. 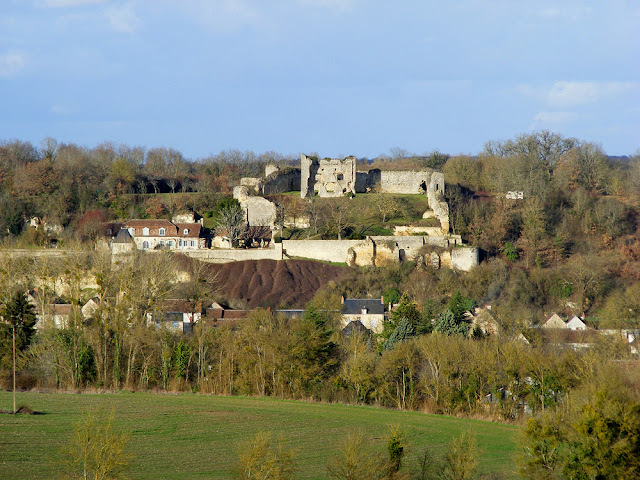 Two are in the collection of the Chateau of Angers (home to the much more famous Apocalypse Tapestry) and the fourth was stolen in 1926 and has not been seen since. The style is Italian and the designer is assumed to be the Florentine painter Andrea Polastron, who lived in Tours in the 1520s, working first for Jacques de Beaune de Semblançay, then after his execution for possibly trumped up charges of embezzlement, for King François I. It was Jacques de Beaune de Semblançay who commissioned the set, and he bequeathed them to the Church of Saint Saturnin in 1527. Only one other Tours tapestry remains extant, and it hangs in the Church of Saint Pierre in Saumur, the place for which it was commissioned and where it has always hung. It came from the Duval workshop, who were active in the second quarter of the 16th century and began work on it in 1538. It took four years to finish and the artists were Angevin (Robert Delisle and Jehan Delastre). This is a soup that many people might find challenging. I would urge you to try it. It is unexpectedly delicious (and rather rich, so don't make the servings too big). As usual, most of the vegetables I used (potatoes, chard, parsley, onion) came from my local organic market garden, the cream from my local dairy farm who delivers to my door. The tomatoes and frozen peas came from the supermarket. Toss the tomatoes in oil and season. Spread them out on a tray and roast for 20 minutes. Chop the chard leaf and stem, keeping them separate. Melt the butter in a boiler and sweat the onion for 8 minutes. 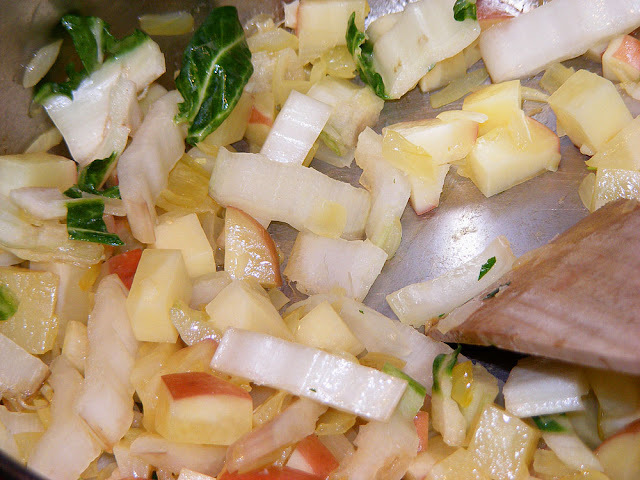 Add the garlic, potato and chard stems, cook for 3 minutes. 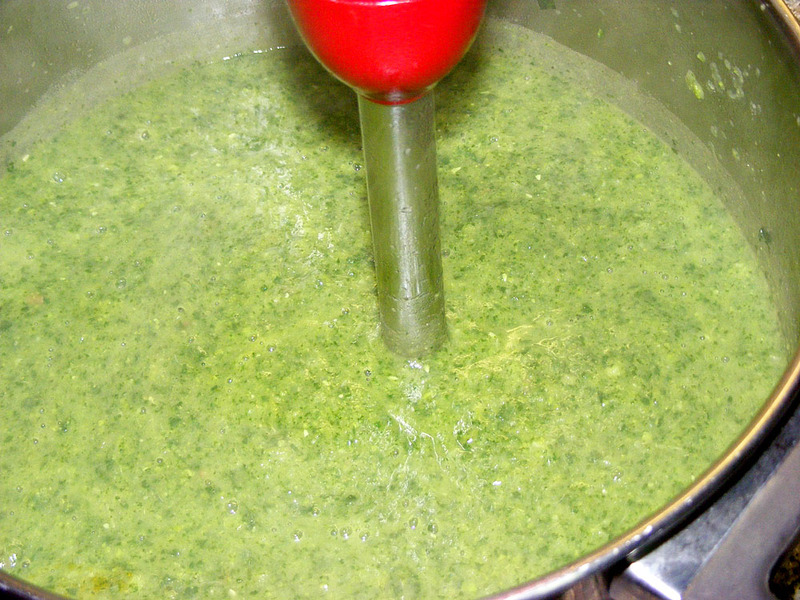 Add the peas, chard leaf and parsley, cook for 3 minutes. Season with salt, pepper and chilli. Stir in the cream and reheat. Serves 7 in bowls topped with roast tomatoes. Amongst the pretty parrots you can see in rural and suburban areas of south-east Queensland is the Pale-headed Rosella Platycercus adscitus. 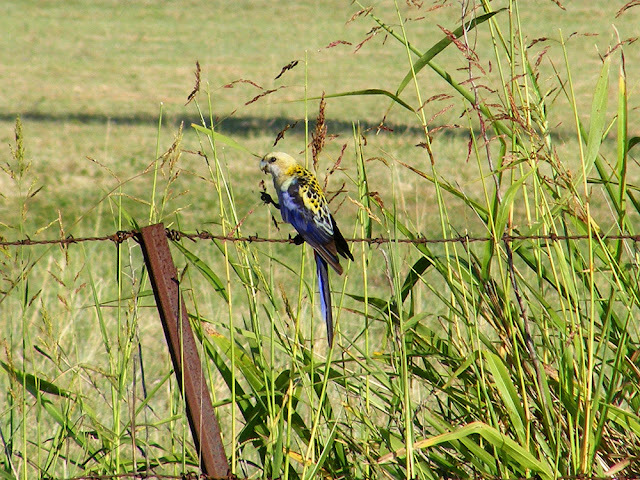 They like grass seeds and fruit, so large rural gardens are frequented, as are roadsides. Their natural habitat is open forest and they need hollow trees to nest. 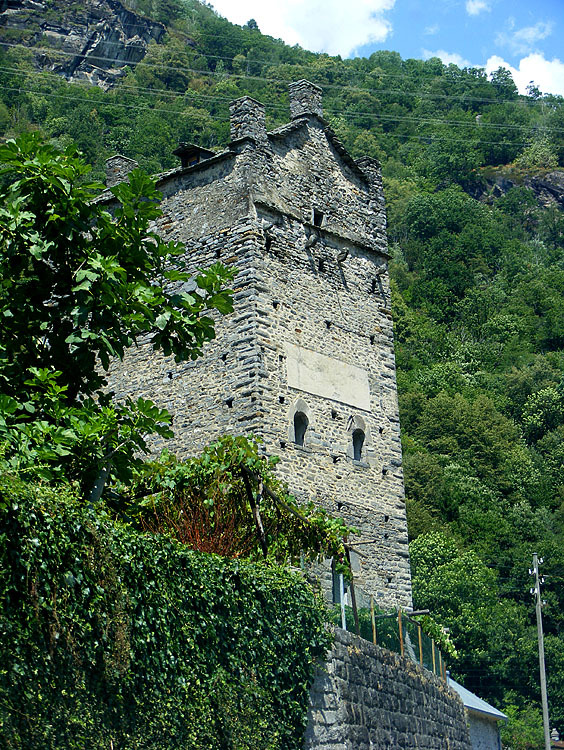 I first spotted this tower in the middle distance as we drove through Grono, so after lunch we went in search of it. For such a tall prominent structure it proved to be surprisingly difficult to find and we drove round in circles for a while. And it's not like Grono is very big! 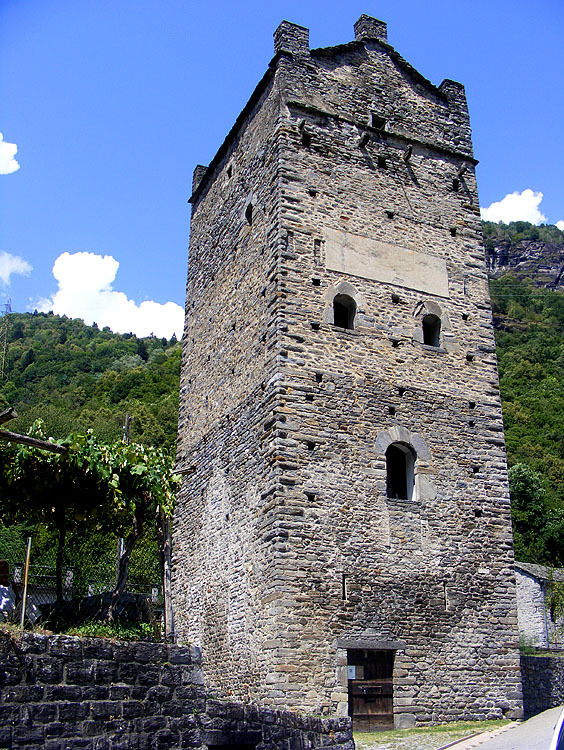 The first mention of the Torre Fiorenzana is in 1286. By 1314 it was owned and inhabited by the powerful von Sax family. According to local tradition, Albert von Sax, the Lord at the time, was murdered there in 1409. Today it remains privately owned by a local family and was restored in 1978. It is currently used as an exhibition space. The square tower is five storeys high, with crow-stepped gables which were added by the von Sax family in the 14th century. The original entry is the doorway high up on the third floor. The plaque above it displayed the arms of the Three Leagues in the 16th century. What the heck is going on in the scene shown in this fragment of tapestry hanging above a fireplace in the Chateau of Langeais? Dominating the picture is a woman in an off the shoulder cat suit decorated with a squiggly pattern that might be snakes. She is barefoot but wears a crown, so is presumably a queen, and she is riding a lion sidesaddle and holding a hawk perched on her arm. Her bearded male companion is dressed in a similar garment, also barefoot. The pattern on his cat suit looks more like eels (or maybe lampreys...that would be good and medieval...). But on the other hand, the patterns may represent locks of hair -- after all, there is a close resemblance to the lion's mane. 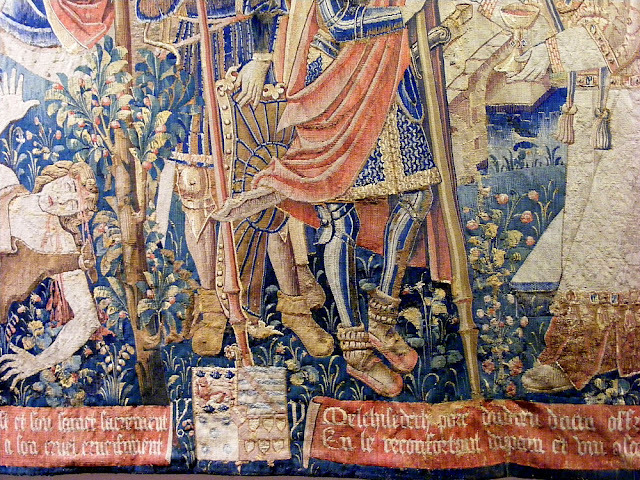 Closer inspection reveals that these two characters appear twice in the tapestry. In the upper left the woman is standing, gripping the shoulders of the man beside her, who is holding a long weapon of some sort. Clearly a story is being told, cartoon style. The ribbon of text should help us interpret the images, but unfortunately it doesn't make much sense and the only words I can make out are maybe 'balde.win' and 'us.de walde.'. 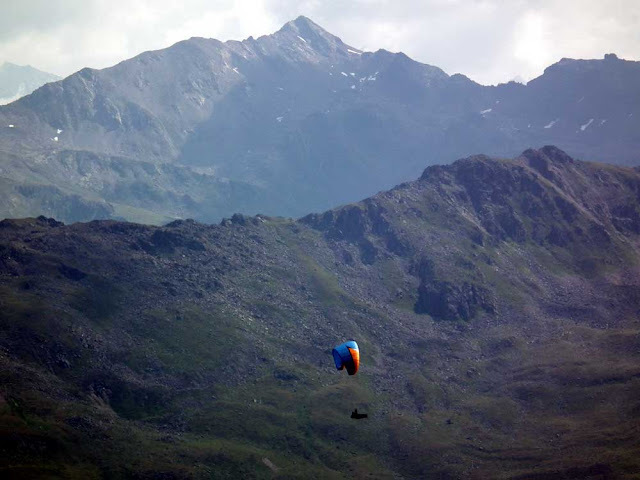 The pair are heading for a castle gatehouse. I feel sure the impression that the tower has eyes that are watching them is deliberate. And there is a trumpeter on the roof, with a pennant showing clasped gauntlets. 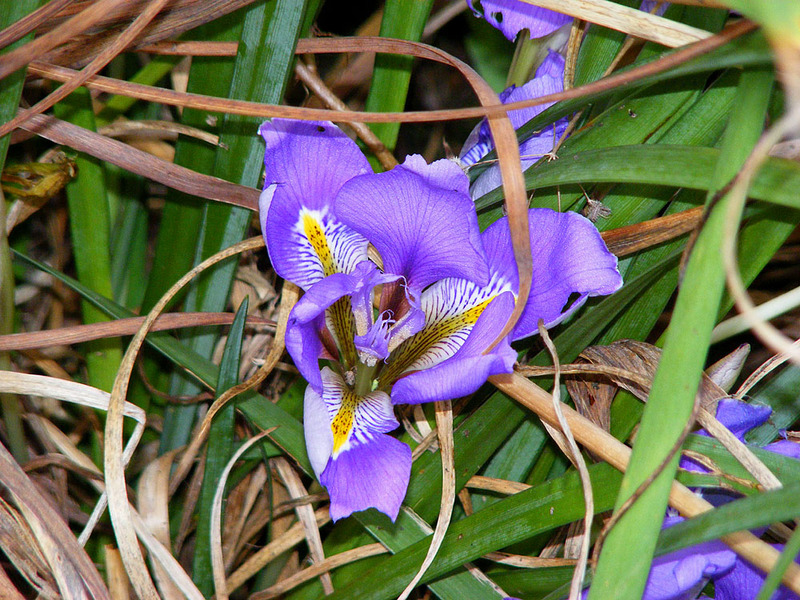 Not a comment on the refugee crisis, but refering to the irises in the back garden. 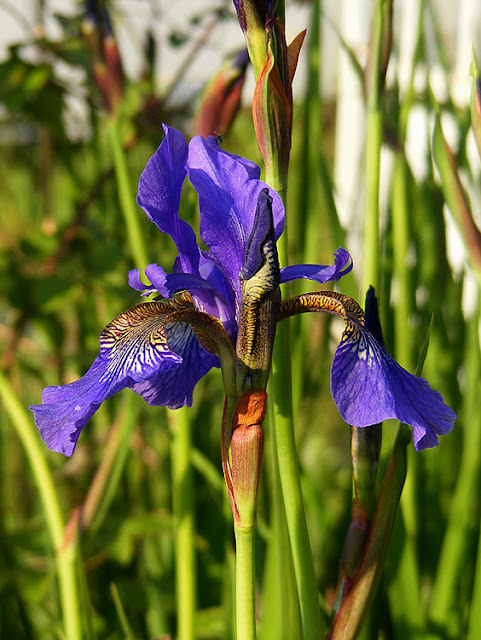 Throughout December and January the Algerian Iris Iris unguicularis have flowered their little socks off. They must have enjoyed the long warm summer and dry conditions and built up lots of reserves in order to have a bumper year. The cold gets to them now and again and the flowers wither, but they certainly earn their keep. 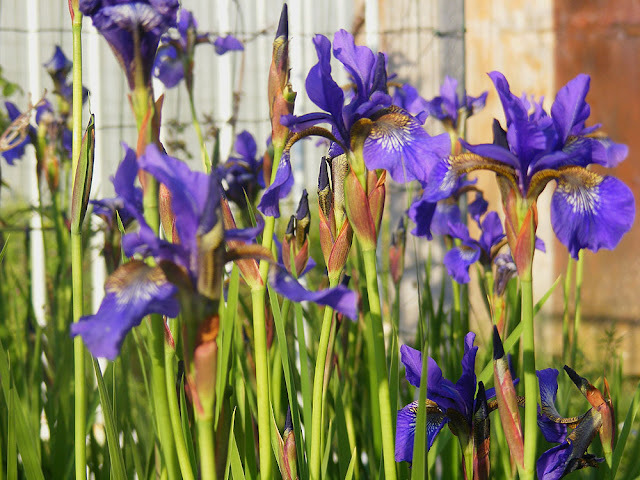 Back in May the Pseudo-Steves (my colony of Siberian Iris Iris sibirica) also had a bumper year, with many more flowers than previous years. I never got round to blogging about them, and as usual, the camera doesn't capture their true shade of deep velvety blue (you can see the tip of a bud above which gives you a good idea of what the petals actually look like in real life). The Pseudo-Steves in full glory. A little something to cheer us up in the gloom and chill. 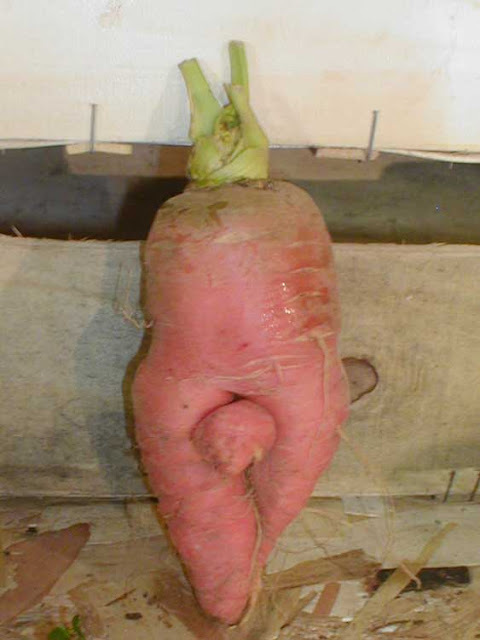 Sorry to descend into puerility but this carrot was irresistible. The reliquary dates from the 13th century and is the oldest object in the collection of the Chateau of Langeais. It was conserved last year by sculpture conservator Laure de Guiran, thanks to a grant from the Fondation Lefoulon-Delalande. The reliquary is polychrome and gilded wood, set with rock crystal cabuchons and carvings representing the Apostles on the sides and the wise and foolish virgins on the lid. I'm afraid we got a certain amount of juvenile entertainment out of the wise and foolish virgins. The conservator removed layers of varnish wax and bronzine (metallic powders in oil, much used in the 19th century) which had oxidised and blackened. Then she cleaned the reliquary and reattached original paint that had flaked off. Her work revealed original gilding and paint, including flesh tones on the carved characters and the colours of their garments, as well as decorative punchwork. 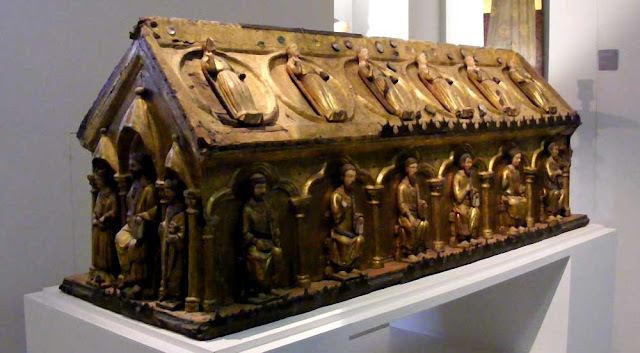 There is an article in English on the Loire Valley Tourist Office website about the reliquary and its conservation, which you can read here. There is also a short video with English subtitles about the conservation which you can see here, or, if you visit the chateau, it is shown alongside the reliquary itself. 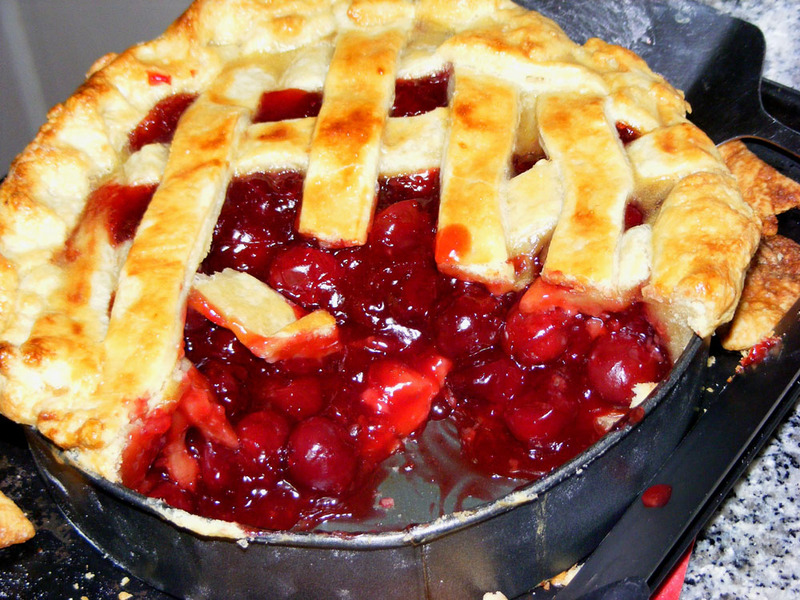 Recently Jean from Baking in Franglais posted a recipe for cherry pie that looked simple and delicious. Like her, I had cherries from our own trees squirrelled away in the freezer so I had the key ingredient and it was about time I used them. I had frozen them after the tedious task of stoning and had just the right quantity for Jean's pie recipe. 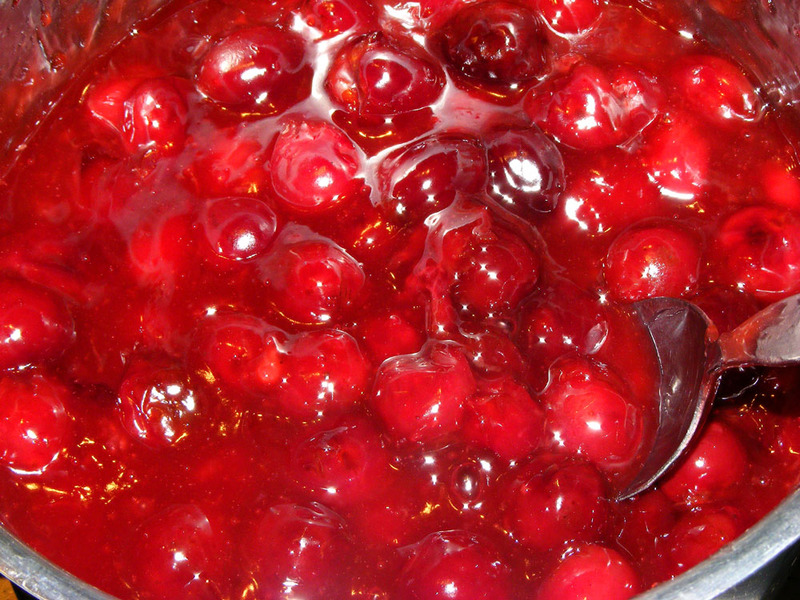 The cooked cherry pie filling. By chance Dotty arrived bearing a lemon, just as I was about to start baking, so I was able to add that instead of the lime I had planned to substitute because I didn't have any lemons on hand. I'm not quite sure why Dotty brought a lemon, except that maybe she felt she needed an excuse to call in and soak up an hours warmth by our stove rather than spend it in her own half renovated, and as yet unheated, house around the corner. The finished pie, with a large chunk removed for immediate consumption by me and Simon. The cherry pie was indeed simple and delicious, fragrant, with well behaved pastry and the cherries didn't ooze all over the place and make a mess. I liked the technique of setting aside a portion of the cherries and only adding them to the filling after the bulk of them were cooked and thickened. The only problem I had was not owning a suitable pie dish. I own two pie dishes, one metal, one ceramic, but they are both enormous. I had to make the cherry pie in a shallow cake tin with a removeable base. The pastry stuck to the vertical sides so a certain amount of undignified prising was necessary to extract the first slice. Nevertheless, definitely a recipe to file and repeat. 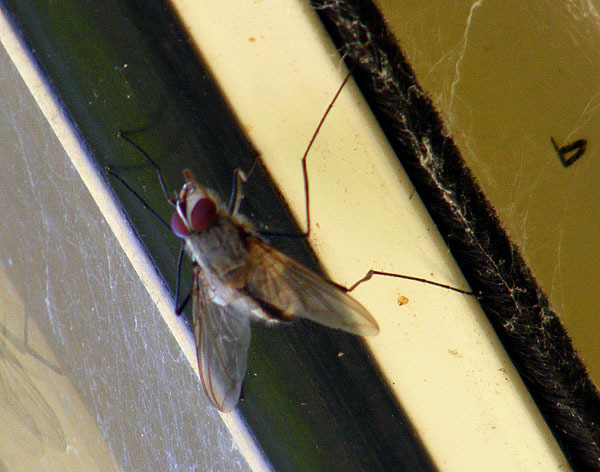 I photographed this fly on the glassed in verandah of Simon's brother's house in Canberra. The last time I saw one was nearly 10 years ago, by the front door on the exterior of my sister's house, also in Canberra. 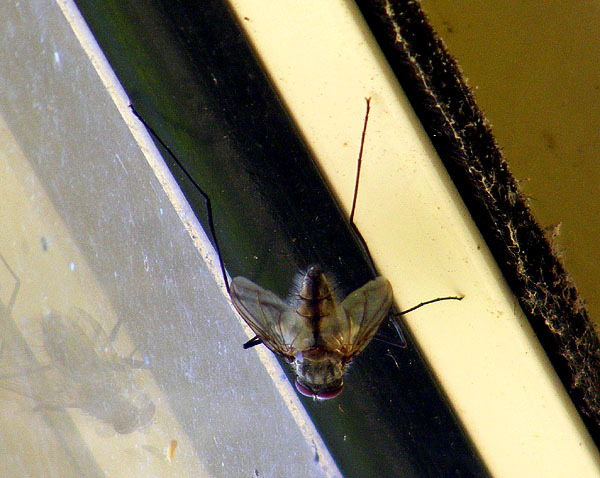 That original one caused a little flurry of interest in the fly world on the specialist dipterists forum, Diptera.info. As a result, I now know that this fly is Senostoma sp, a parasitic fly. 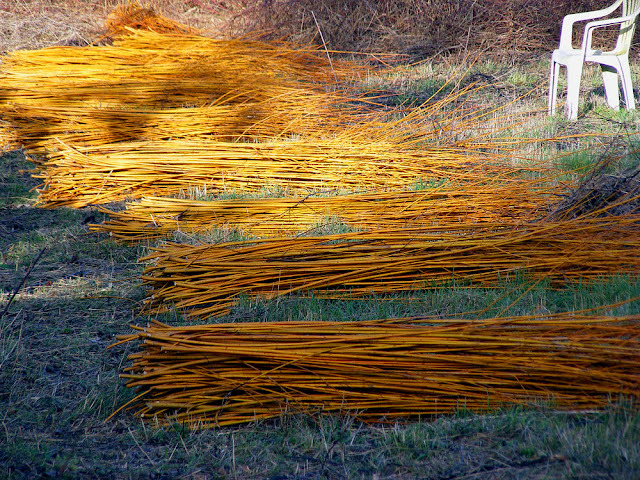 They belong to a particular group easily identifiable by their very long legs and bristly bodies. 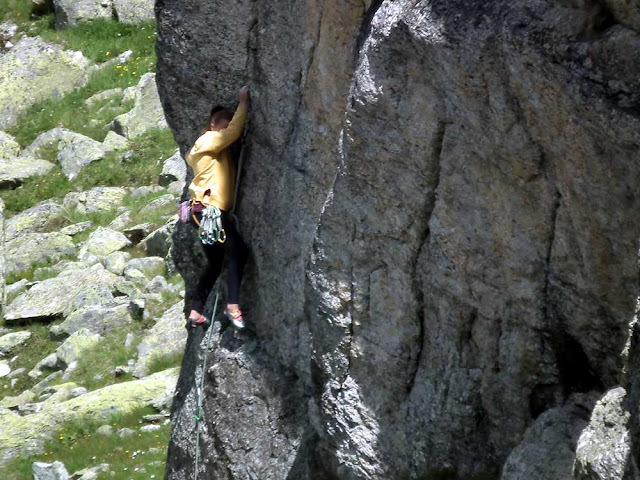 Getting beyond that though is often difficult, especially from just photos. Senostoma spp are all native to Australasia and they mostly parasitise beetle larvae from the scarab family. The genus Senostoma was first described by the French entomologist Justin Pierre Marie Macquart. There are at least 29 species and they generally prefer dry upland eucalypt forest. 2019 is the International Year of the Fly. Look out for events near you. 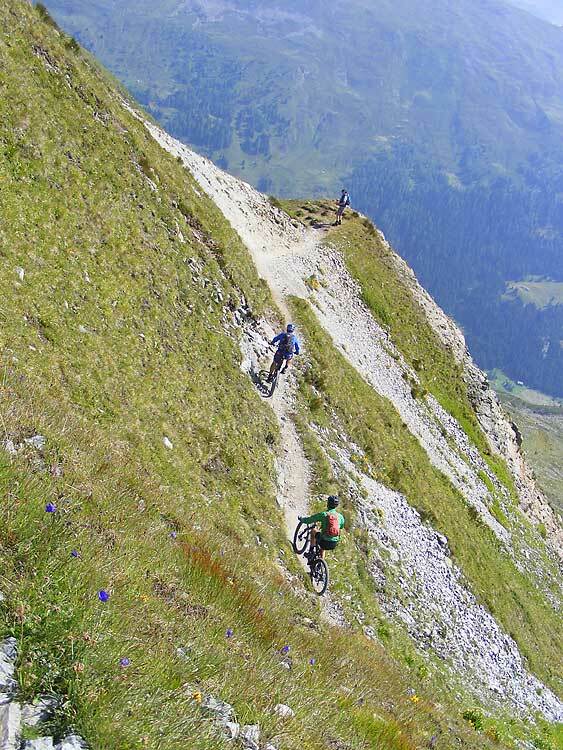 Are things I will not be doing in Switzerland later this year. It seems to have been a point of honour amongst tapestry weavers that no two characters in a work should wear identical shoes. Maybe it was a means of demonstrating their skill, but the range of footwear in 16th century tapestries is simply astonishing (and presumably reflects the tremendous range of fashionable and practical footwear available in real life). It may also be a device to help identify characters if they are repeated in the tapestry in order to tell the story. These two photos are details of the same tapestry, hanging in the Chateau of Langeais. Above we have two guards in full plate armour -- except for their footwear. One is wearing comfy suede short boots, the other is wearing pattens and slashed leather socks. Below, a man adjusts what looks like a leather above the knee over-boot, fastened by buttons and loops up the outside seam. Whenever I see tapestries like these one of the first things I check out is the range of foot and leg wear on show. Good for hours of enjoyment and fascination. At the end of the evening we ended up folding napkins for fun. It all started because someone idly folded his napkin and those of us sitting next to him were intrigued. He said his grandfather always folded his napkin like that at the end of a meal, and showed us how to do it. The next thing you know the whole table of 30 odd people was folding napkins, then Martine the restaurant manager showed people how to do the fold that greeted us when we had sat down a couple of hours earlier. So we went out for dinner and came home with a new skill. Main course of zander in saffron sauce, celeriac mash and ratatouille. Cheese course -- cambembert, pont l'eveque and Sainte Maure de Touraine goats cheese with salad. Sorry - I forgot to photograph dessert, which was nougat icecream with apricot coulis. 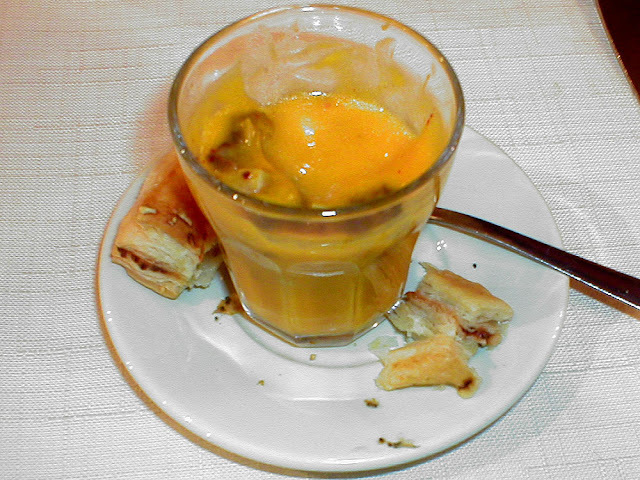 But don't panic - Simon took a photo of this dessert (his favorite) years ago. Photo courtesy of David Henderson. We live about an hour south of the Loire River. Our climate is a mixture of continental and maritime. 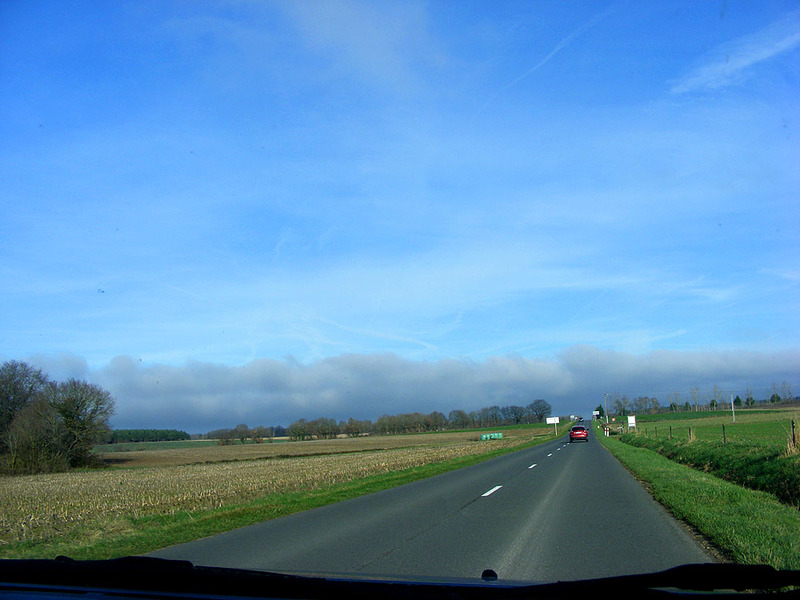 The Loire is a big enough river to make it's own climate, drawing up moist air from the Atlantic, and often it is visible as a band of cloud as you drive towards it. 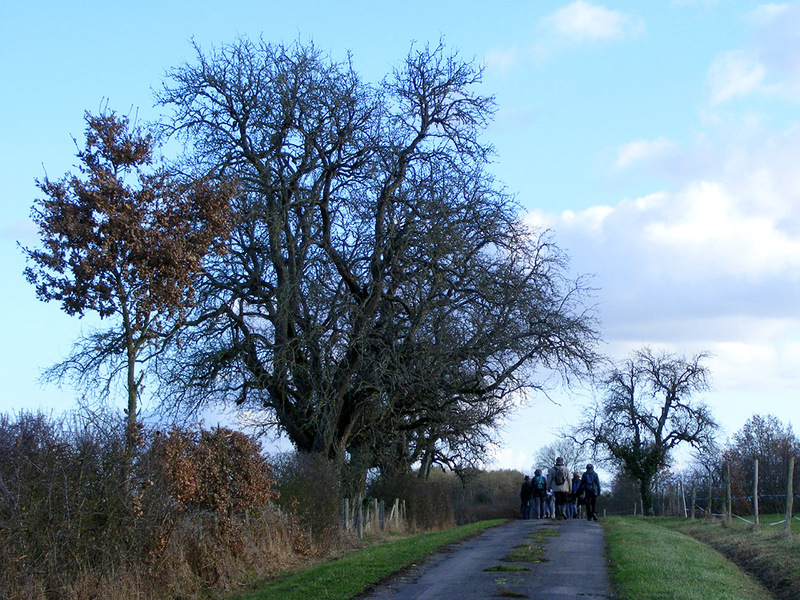 The picture below was taken on Boxing Day 2018, just outside Preuilly as we travel north towards Loches and on to the Loire beyond. This battered polychrome wooden scuplture is in the collection of the Chateau of Langeais. We think it is probably 14th century. 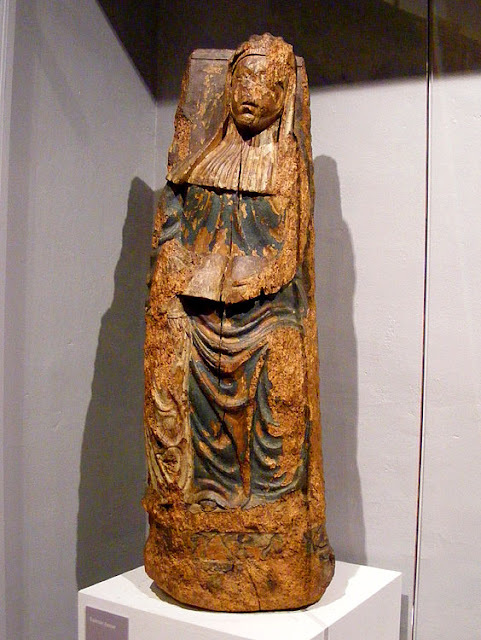 It depicts Saint Anne. She is holding a book, and as Niall pointed out to me, the pale bit on her right must be the Virgin Mary, who she is teaching to read. This story of Saint Anne teaching Mary to read was part of a campaign in the Middle Ages to encourage parents to teach their daughters to read. Middle class and aristocratic girls were frequently destined to run the family business on behalf of their husbands or fathers once they were grown women. While the men were away on business trips or working for the king, the women were at home making sure the family estate or shop continued to earn. Capable women were left in charge because although educated, they could not usurp the absent men. 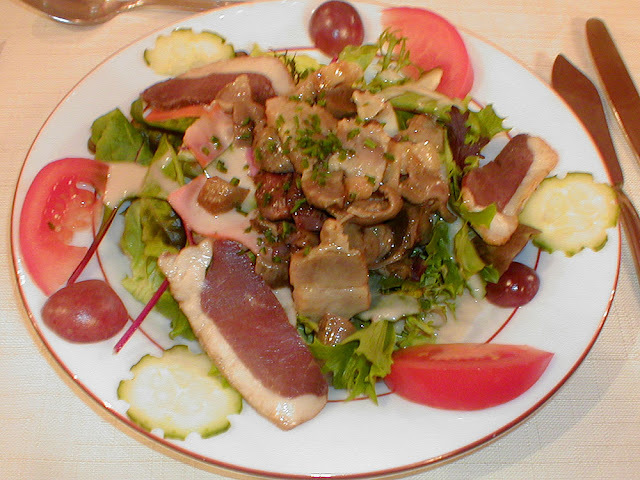 Poule au pot is one of the most well known and simplest French country recipes. It is nothing more than a boiling hen simmered for hours with root vegetables and some herbs but it was made famous by King Henry IV, known as le bon roi Henri, announcing that he wanted every labourer in his kingdom to be able to have poule au pot on Sundays. I make it with a chicken from my local poultry producer and vegetables from my local organic market gardeners. 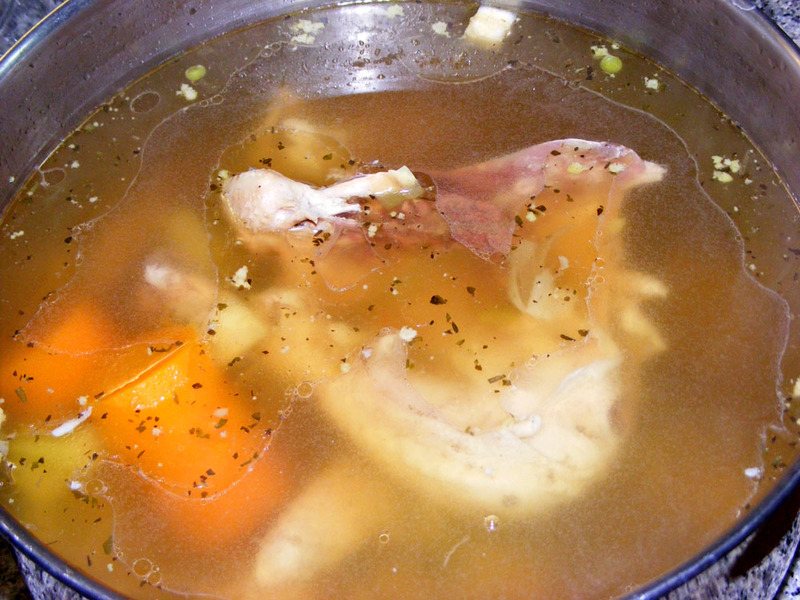 Put the chicken in a boiler and pour in the stock. If the chicken is not covered add some water. Add the shallots, garlic, herbs, carrots, leek and celeriac and bring to the boil. Simmer for 2 hours until the chicken is falling apart. Add the remaining vegetables and cook for a further 10 minutes. Serve in bowls with chunks of chicken, vegetables and a couple of ladles full of stock and some pieces of crusty bread. 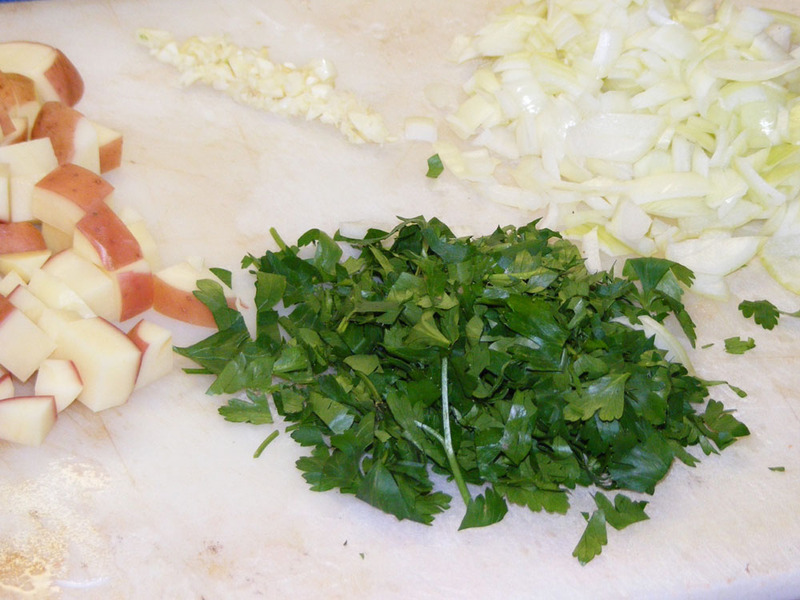 A truly traditional poule au pot would have turnips as well as carrots so you can add them if you like them. The traditional dish would not have peas and cabbage added at the end either. For something more in keeping with the simple peasant origins of this dish you could add white dried beans along with the carrots and leek. This isn't a classic addition, but is a variation I'm sure appeared quite regularly on people's tables. In season, broccoli rabe added at the end would be nice too. Until recently this was arguably the most feared Australian spider. It is common and it can bite. The bite causes burning pain and inflammation. It was widely believed to be the cause of necrotic ulcers, but a well designed study by a respected toxicologist concluded that the spider bites had not caused infection or necrosis. 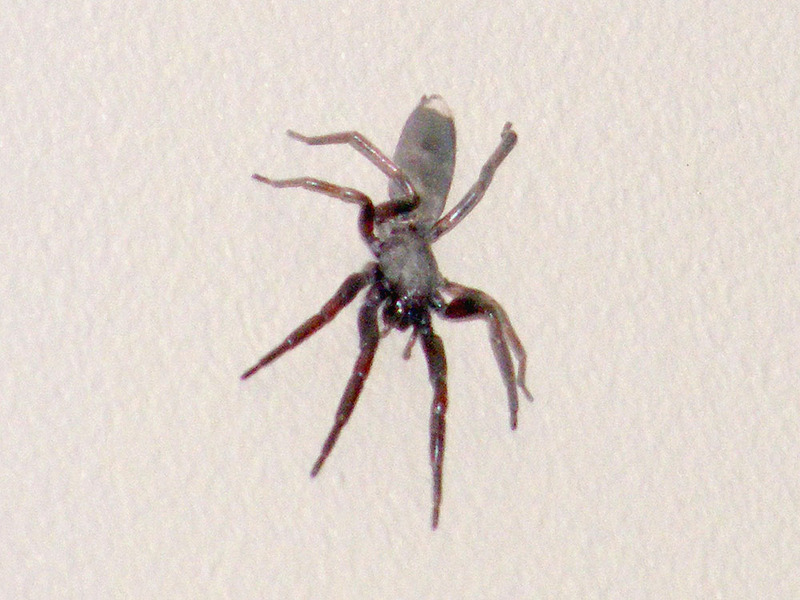 Typically the reports of necrosis were not associated with proven spider bites and the belief seems to have arisen because of reports associated with a spider that does not occur in Australia. There are two very similar species of White-tailed Spider Lampona spp, both native to Australia. They live in and around human habitation and bites often occur when the victim is dressing because the spider hides in clothing or linen. These nocturnal hunters prey on other spiders, especially House Spiders Badumna spp.